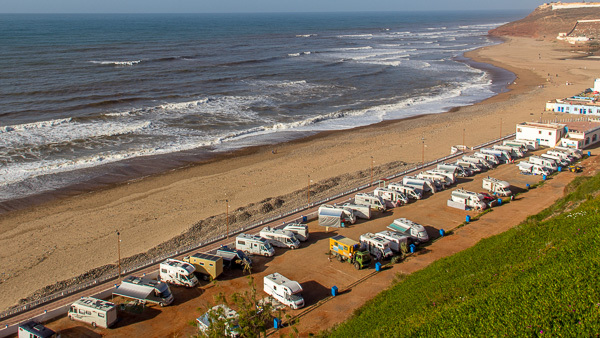 As it turns out, driving a camper van down Morocco’s Atlantic coast is apparently a thing for middle-aged Europeans. Mirleft and especially Sidi Ifni are popular stops on this “camper van highway”, as we like to call it. This in turn influences the cities’ atmosphere as hostels and cool cafés to hang out at are literally next to none. 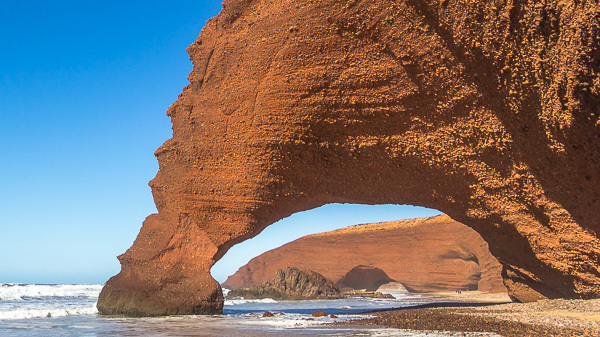 I’m not going to lie – as backpackers, we didn’t enjoy Morocco’s Atlantic coast as much as we’d hoped. The beaches are quite nice and there are some legendary surf spots, but one important thing is missing – the backpacker vibe. With the exception of paradisiacal Imessouane, the coast has instead been besieged by a grey-haired, motorised demographic. 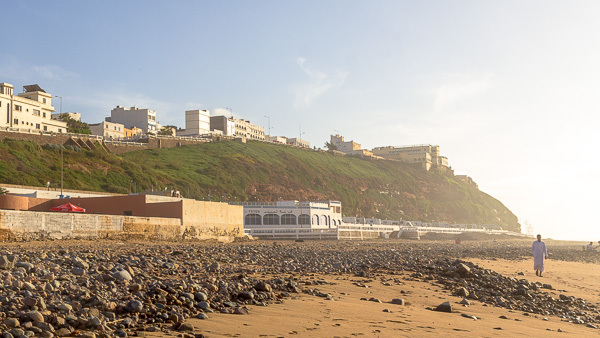 Located 400 km south of Marrakech, Sidi Ifni is the starting point for many travellers going up the Atlantic coast. Since the majority of visitors stay on the campground, backpackers basically have the choice between a +300 dirham hotel room or a 50-60 dirham room in one of the local “café hotels”. We opted for the latter, and although it was indeed the cheapest accommodation we found on our entire Morocco trip (35 dirham per person! ), it should be mentioned that this option is not for the faint hearted. Suffice to say that the dirt didn’t stop at the dirt-cheap price. Although the city itself struck us as quite lifeless, especially once we ventured away from the tourist areas, it still has its charms. One is the long boardwalk, which takes you on a relaxing stroll between picturesque blue-and-white painted houses on one side and the inviting, albeit rocky, beach on the other. At the end of the boardwalk you find a few local surf shops where aspiring surfers can connect with their inner Kelly Slater. 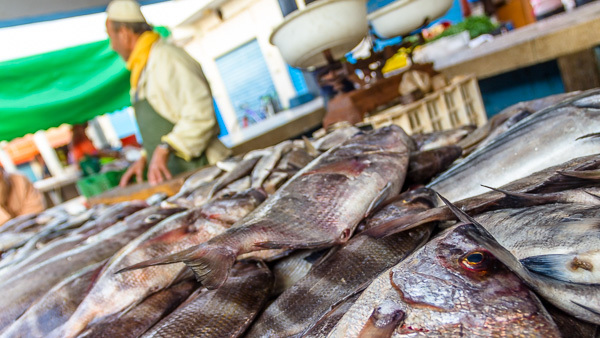 Another place worth a visit in Sidi Ifni is the fish market which fills with all sorts of colourful sea creatures in the late afternoon. For an hour or so, it turns into a full-on show of loud bargaining and parading tourists. If you’ve got the time, the 6 km walk along the beach to the impressive natural rock archways of Leghzira makes for a beautiful day trip. Keep walking another 10 minutes past the archways and you’ll see a little cluster of restaurants that will be happy to serve you a tagine or some typical tourist fodder before you head back. Less than an hour up the coast from Sidi Ifni, Mirleft is less overrun by camper vans but perhaps even more “meh” in terms of atmosphere. It’s an oddly divided city with neighbourhoods spread out on a bare piece of land next to the sea. Charm-wise, Mirleft doesn’t really have much to offer. Apart from the usual cafés and a fair share of tourist restaurants on the main street, entertainment is minimal and you’ll soon want to go hang out at the beach. And well, that’s the thing about Mirleft – it’s set on a cliff. There are numerous small beaches in the area, but they’re everything between a 15-20 minute walk from the city centre to a car drive away. From Mirleft, Leghzira is an easy 30-minute local bus ride away. Therefore, we highly recommend following our example and staying at Café Aftas since it is the only hotel that is on the beach itself. Not only does it have the by far best location in Mirleft, it also has that backpacker vibe. All in all, as long as you adjust your expectations to this reality, nothing stands in the way of enjoying a few days on the camper van highway with the four-wheeled nomads! 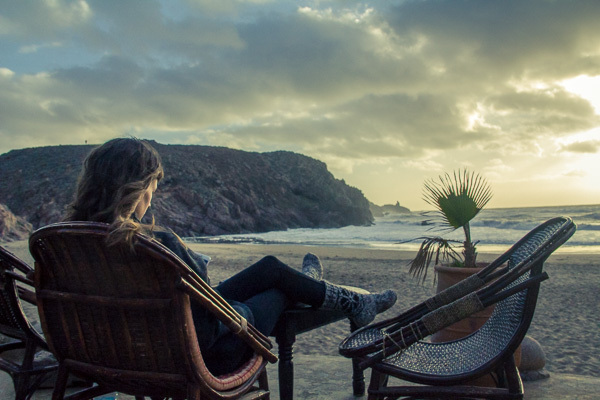 And when you’ve seen more visors and sock’n’sandal-combos than most people do in their entire lifetime, why not head up to Imessouane to kick back in an actual backpacker beach paradise?